florida girl in dc: BREAKING: A Decent Cuban Sandwich on DC's Horizon??? BREAKING: A Decent Cuban Sandwich on DC's Horizon??? Price of Petworth stumbled upon El Floridano, a new street food cart that promises to give DC a Cuban Sandwich worthy of all of us ex-pat Floridians. I'm just bummed I didn't break the story first! Follow El Floridano on Twitter at @FLmeetsDC. And, Stephan, I expect a ride-along or something fun. Hellllloooo... *I'm* @FloridaGirlinDC! In other news, I'll be back in Tampa this weekend... and Cuban toast with cafe con leche is most definitely on the agenda. Yummy tip - I will look for this truck. 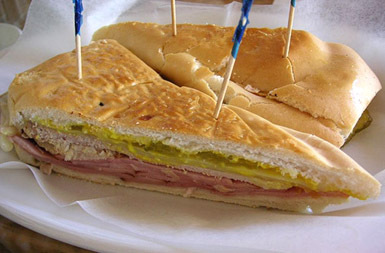 What's the FL review of Cubanos by the SS metro? Cubanos by the SS Metro would not really survive in Miami. It's not bad, just not great. In Miami, it would be average, but up here it doesn't really have much competition. The best full restaurant I've found is in Burtonsville and is called Cuba De Ayer. My only complains were that the black beans were a little salty. But overall a pretty good Cuban place, run by cubans that settled here in the 70s. I can't wait to try "el floridano". I def agree that Cubanos isn't all that great. My mother is born and raised in Cuba so I grew up on authentic Cuban food. I will also agree that my favorite Cuban restaurant in the area is Cuba De Ayer, closest thing to my grandmother cooking I've found! I'm interested in trying Mi Cuba Cafe off park road, anyone been?